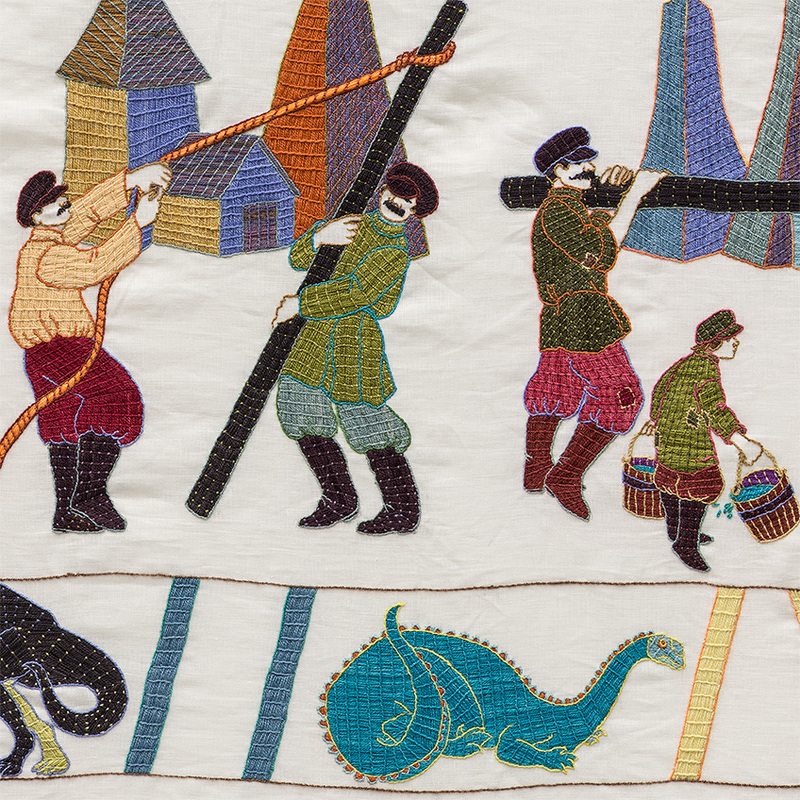 I think my favourite story to work on has been the 434 dinosaurs that are in the tapestry. So much has changed about what we know about dinosaurs and all because the study of fossils and dinosaurs has grown up alongside geological survey for mining and petroleum drilling. Studies say dinosaurs were much more colourful than originally imagined and many were feathered, and in fact birds are their distant relatives. Only 50 years ago we were taught that oil was made from decomposed dinosaurs and plants. Today research suggests oil formed from aquatic algae, called diatoms. Much more than half of all life on earth died in a mass extinction at the end of the Cretaceous period. The most agreed upon theory, based on research, suggests the cause was when an asteroid collided with the earth and triggered volcanic eruptions, that disrupted weather patterns, growing seasons and ecosystems. This one-two punch killed off the majority of Earth’s flora and fauna, including the dinosaurs, all of which were unable to adapt to the changes in climate. Bitumen bubbled up in the waterways of the marshes in Iraq 5000 years ago. Settlements of people living by these marshlands in Ancient Mesopotamia used the bitumen to help build elegant dwellings from reed and mud mixing in the bitumen to make them waterproof. Each house was built upon islands made of reed and looked like it was woven fabric, sometimes with towering pillars capped with lacy spirals made of reeds bound together. The marsh people also built canoes engineered out of reed and waterproofed them with bitumen so they could navigate the waters to hunt and fish and visit friends and family in the neighbouring floating reed island homes. The Marsh Arabs lived like this right up until modern times when in the 1990s Sadam Hussein’s regime drove them out. The army bombed their settlements and a dam was built to redirect the water away from the marshes. Today work is underway to repair the damage to some of the marshes and the area has been listed as a Unesco heritage site. There is an effort to resettle the area but is precarious due to low rainfall and the damming of the Tigres and Euphrates rivers in other areas. The early achievements using bitumen in building shelter lay the foundation for the next advancement in Mesopotamia - bricks made from mud, straw and bitumen. The bitumen was mixed into the brick and also used as mortar. Architectural feats were made possible leading to works such as the Ishtar Gate of Babylon that lead into the city compound, the hanging gardens of Babylon and temples of Babylon commissioned by King Nebuchadnezzar II, who advertised his military might through awe-inspiring architecture. Who does not like a cloak and dagger mystery that remains unsolved to this day? Rudolph Diesel spent his adult life inventing his engine to run on peanut oil as he worried that one day the vast resource of oil and gas might run out. He presented his engine at the Paris World’s Fair in 1900. In 1913, on the eve of the First World War, Diesel boarded the ship the SS Dresden on a trip to London. He was in financial difficulty. It is said he was going to sell his engine to the British government. He went to his stateroom at 10 in the evening asking for a wake up call at 6 am. The next day he was gone. Weeks later his decomposed body was found in the ocean. The official cause of death was said to be suicide. However many argue he was murdered either by agents of the world’s oil companies to prevent the engine from replacing gas burning combustion engines or German government agents in an effort to prevent the engine falling into British hands. We will never know. When Bertha Ringer married Karl Benz in 1872 she invested her dowry in his company, trusting that he would succeed in making an internal combustion engine car. He did but was apparently too busy perfecting it to get the word out. Bertha took matters into her own capable hands. On August 5, 1888 she did something that had never been done before. She left the house with her two teenage sons in tow, didn’t tell her husband where she was going, and proceeded to drive from Mannheim to Pforzheim in one of Karl Benz’s Patent Motorwagen to visit her mother. The trip was 60 miles long. No one had ever driven so far, for so long, in a car before. Along the way there was plenty of mishaps. When she ran out of fuel Bertha bought more from a pharmacy. When the chain for rotating the wheels broke, a blacksmith provided the mending. Her hairpins came in handy to clean a fuel line and her garter provided insulation for a wire. Once she arrived in Pforzheim Bertha telegraphed her husband to let him know of her successful journey. The next day she returned and the newspapers of the day covered the awe-inspiring story. She provided Karl with much insight into its trial run and suggested adding a much-needed additional gear for climbing hills. He listened. Bertha demonstrated that the automobile could be useful to the general public, and the publicity boosted business for Karl’s motorwagen. Thanks to Bertha and her resourceful and adventurous nature Benz is still a recognized name in the car industry today. The Nobel brothers led lives worth studying. The brothers had a multitude of skills that included chemistry, engineering and entrepreneurship, first learned at their father's knee and by his example. Their Swedish father was an engineer and failed businessman who moved the family to St Petersburg in Russia where he eventually changed his fortunes through successfully making tools and manufacturing explosives. It was an important lesson for the boys as their father showed how if all else fails, try, try again. Robert Nobel, the eldest brother, put up a very small amount of capital and invested in a distillery in Baku Azerbaijan in 1876 with a couple of other businessmen who put up quite a bit more. His brother Ludvig soon got involved and very quickly they turned the distillery into Branobel (Nobel Brothers) a petroleum company. The company grew to such heights that it produced 50 percent of the world's oil in its time and Ludvig negotiated for the lion’s share of the profits. At the time of the transition from distillery to oil production the company invested and built the earliest pipeline transport. As well Ludvig became a pioneer in the building of oil tankers and oversaw the development of Zoroaster, the first successful ocean going vessel used to transport kerosene. Surprisingly Ludvig refused to patent the design of it and so was widely studied and copied, with nary a ruble exchanged for the knowledge. The ancient Chinese invented the spring pole drill to dig deep underground for salt brine. They evaporated the brine in salt ponds or in large pans left out in the sun to get salt. Salt was highly valued and was an early trading export used as currency. Through the invention of the spring pole drill in 2nd century AD they could reach depths of 460 feet with drill heads that look remarkably similar to what are employed today in drilling for oil. While drilling the Chinese inevitably hit pockets of natural gases. The invisible gases sickened or killed the drillers or would catch fire or explode. People believed they had angered the gods and spirits underground or that they had come upon a dragon’s lair. Over time the observant ones realized there was cause and effect happening and figured out the nature of gas and that they could capture it and harness it to their needs of cooking down salt brine. Using pipelines made from bamboo the gas was piped to outdoor cooking stoves where the gas was then lit in a controlled manner and could cook down large vats of salt brine speeding up the process of making salt and contributing to trade along the Silk Route.